Annamalai University Distance Education. Annamalai University was established in 1929 under the Annamalai University Act, 1928. It is the largest University from southern India, located in Annamalai Nagar, Tamilnadu, India. 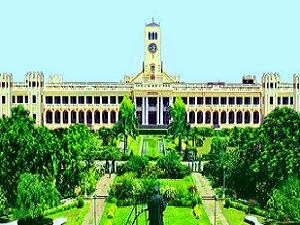 The Annamalai University has been named after Dr. Rajah Sir Annamalai Chettiar and offers Undergraduate, Postgraduate, Diploma, PG Diploma and Certificate programmes under regular mode as well as distance learning mode. These programmes are helpful for students who want to pursue higher education in the field of information & technology, arts, science, management, engineering, education, and agriculture. The Annamalai University campus is spread around 1,500 acres area in Chidambaram, Annamalai Nagar, Tamilnadu, India. However, University campus is full of greenery, amusement and provides an excellent environment for study, it is also known for its well infrastructure and location. The Annamalai University has been accredited by “NAAC” (The National Assessment and Accreditation Council) with B++ grade. Recently, University also witnesses another achievement that a record 13 students have been selected for MSP (Microsoft student partner) programme, which is big achievement by the students of Computer Science and Engineering Department. Annamalai University has been accredited with “B++” Grade by NAAC society. Annamalai University is recognized by UGC (University Grants Commission) New Delhi. Annamalai University is also affiliated under DEB (Distance Education Board), New Delhi. The Directorate of Distance Education, Annamalai University, Tamilnadu has been established in the year 1979. Annamalai University - Directorate of Distance Education (DDE) offers more than 501 distance education Courses/Programmes for Undergraduate, Postgraduate, Diploma, PG Diploma and Certificate students. These distance learning programmes of Annamalai University are helpful for those students who want to pursue a higher education degree but could not able to attend due to lack of time or short of money. Annamalai University, Directorate of Distance Education is well equipped with top faculty members, infrastructure, computer lab and strict administration to provide better environment for studies in the campus. The Directorate of Distance Education DDE, Annamalai University is offering following Undergraduate Courses (Duration: 3 years) for the academic year 2019-2020. Postgraduate Courses for the academic year 2019-2020. Professional Courses for the academic year 2019. Diploma/PG Diploma Courses for the academic year. Certificate Programmes/Courses for the academic year 2019-20. Information & Technology Programmes for the current academic year. Note: Personal contact programmes are compulsory for IT related Programmes. Spot admission: Annamalai University provides Spot Admission facility to those Applicants who live near to any Study Centers mentioned in prospectus "Annexure-I." Selection in any programme will be made by the Study Center. All spot admissions must be confirmed by the Director or will be cancelled if found not eligible. Filled in application form along with attested xerox/photostat copies of Certificates of eligibility, age and qualifications. Attested passport size photograph should be affixed on the Application form. Qualification and Transfer/ Migration Certificates in orignal. 2 Passport size Photographs without signature to be pasted on Scanning Form and Identity Card. Original documents will be returned after verification. Students who want to take admission through post should not enclose original certificates and demand draft with the application. Migration/Transfer Certificate and, a Demand Draft of Course Fee drawn in favour of The Director, D.D.E., Annamalai University. If the documents/certificates submitted by student found fake, his/her admission will be cancelled and the course fee will also be forfeited. To know more about distance education courses keep visiting www.educationfrog.com Or Subscribe to our blog by entering your email in the box available in top right side of our blog.